Say “Bem Vindo” to the Marvelous City! Overlooked by Christ the Redeemer, Rio is famed for its vibrant music, dance, and Carnival celebrations. Monograms has made it easy for you to experience the splendor of the city with this 4-day vacation getaway. We’ve included your hotel reservations, private sightseeing, and daily breakfast, so that you can relax and make the most out of your experience. And to ensure that your vacation runs as smoothly as the Samba, we provide you with a Local Host® – someone to help show you just how marvelous Rio really is. Your vacation begins as soon as you step off of the plane. Monograms can pick you up at the airport and get you to your hotel effortlessly. 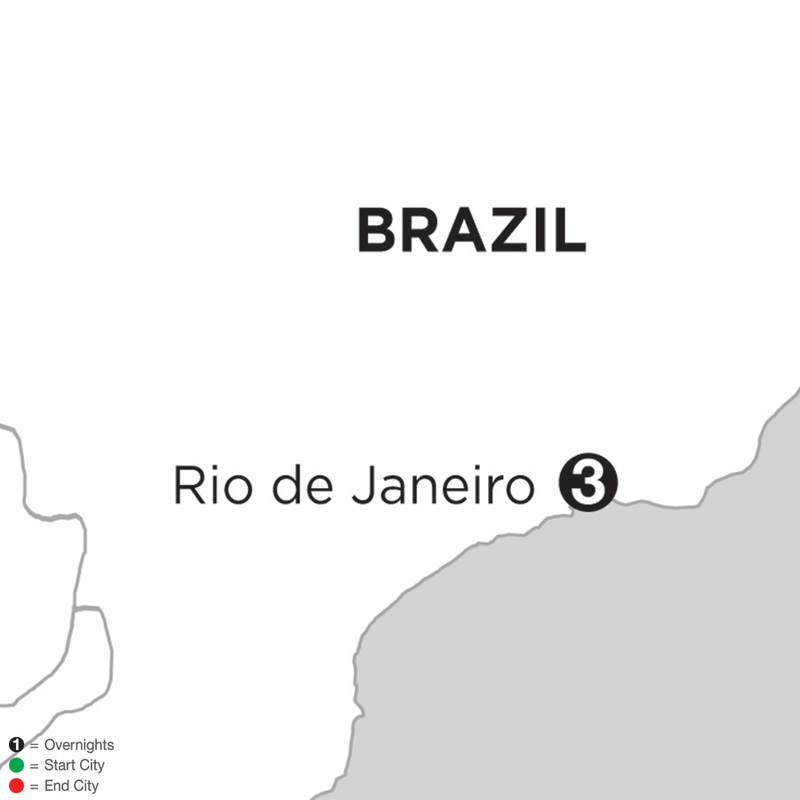 Your Local Host will meet you to help direct you to the best of Brazil’s most bustling city. The next morning, indulge in your included breakfast before you head off on your private tour of the Cosme Velho district. Climb to the top of the Corcovado Mountain aboard a cog-wheel train to see the famous statue, Christ the Redeemer. You will learn about this omnipresent peak, how it is considered one of the Seven Wonders of the World, and stand in awe at the sweeping views of the city below. In your free time, discover Tijuca National Park by way of a Jeep tour. Discover historic Petropolis, home to the former summer Palace of Dom Pedro II, or choose to take an excursion to the top of Sugar Loaf Mountain. With so many captivating sights and historical treasures, there is something for everyone to enjoy! Our goal is to make your Rio de Janeiro vacation as simple as possible. “Adeus” to the hassle of planning your vacation. When Monograms coordinates the details, you save time and money, so that your only focus is creating unforgettable memories! Your Local Host helps you skip the lines during your private city tour with your included ticket to the top of Corcovado Mountain to see the Christ the Redeemer statue, the symbol of Rio. Today, your PRIVATE TOUR takes you to the Cosme Velho district, where you board a cog-wheel train that will take you through the lush tropical vegetation of Tijuca Forest to the top of CORCOVADO Mountain. This rounded peak rising 2,300 feet from the bay is one of the New Seven Wonders of the World and home to the iconic statue of Christ the Redeemer. Enjoy a breathtaking 360-degree panorama, which affords sweeping views of the city and beaches below. The afternoon and evening are at leisure. Tonight, you may opt to join an outing to a fun churrascaria for a feast of barbecued meats that are marinated and roasted over charcoal in true Brazilian style. Enjoy a full day at leisure. Your Local Host will suggest an optional Jeep tour to the rainforest in the middle of the city, Tijuca National Park, and its bird sanctuary. This afternoon, you may elect to discover historic Petropolis, a mountain resort and site of the former summer palace of Emperor Dom Pedro II, or take an optional excursion to visit iconic Sugar Loaf Mountain.